To the Honourable Senate & House of Representatives to be Convened at Concord on the third Wednesday of November A.D. 1798. The Petition of the Inhabitants of a Place called Bethlehem in the County of Grafton in the State of New Hampshire Humbly Sheweth, that whereas the said inhabitants are settled on a tract of land Formerly Belonging to said State and lately sold by order of said State for the Purpose of making and Repairing the Road From Conway to the upper Coos and down Ammonoosuc River to Littleton, and that the Number of Settlers being increased to more than Forty it becomes highly necessary for the Peace and Good Order and Prosperity of the said inhabitants that they be vested with Lawful authority to Govern themselves and transact such Business as Respects them as a people which is Nearly impossible to be done without – Therefore the said People of Bethlehem from the above Considerations Sincerely Pray the Honourable Court that so much of the aforesaid Land be Formed into a Town and incorporated by the Name of Bethlehem as lies between the following Towns and adjoining the said tract of State land Littleton on the west Whitefield on the North Britton Woods on the East Franconia & Concord on the South Containing about 27000 acres; and as in duty bound will ever pray. On December 1, 1798 a hearing was set for the document for the next session and public notice concerning the bill was given. At its next session, one year later, the Senate passed the act of Incorporation on December 25, 1799. The oficial papers were signed December 27, 1799. Formed in 1997, the Society is located in the completely restored Ranlet Cafe that was moved to this location in 1895. 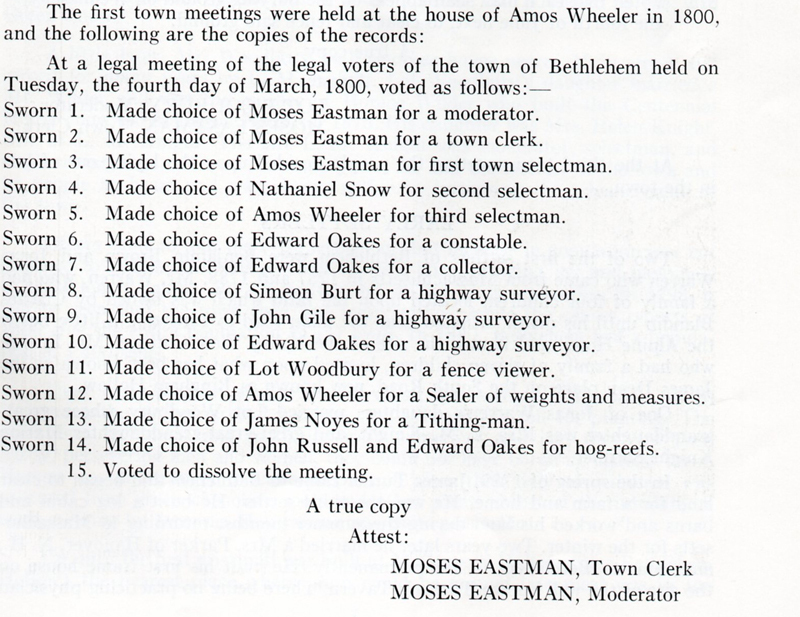 With over 260 members, it is an ever-changing display of Bethlehem history.